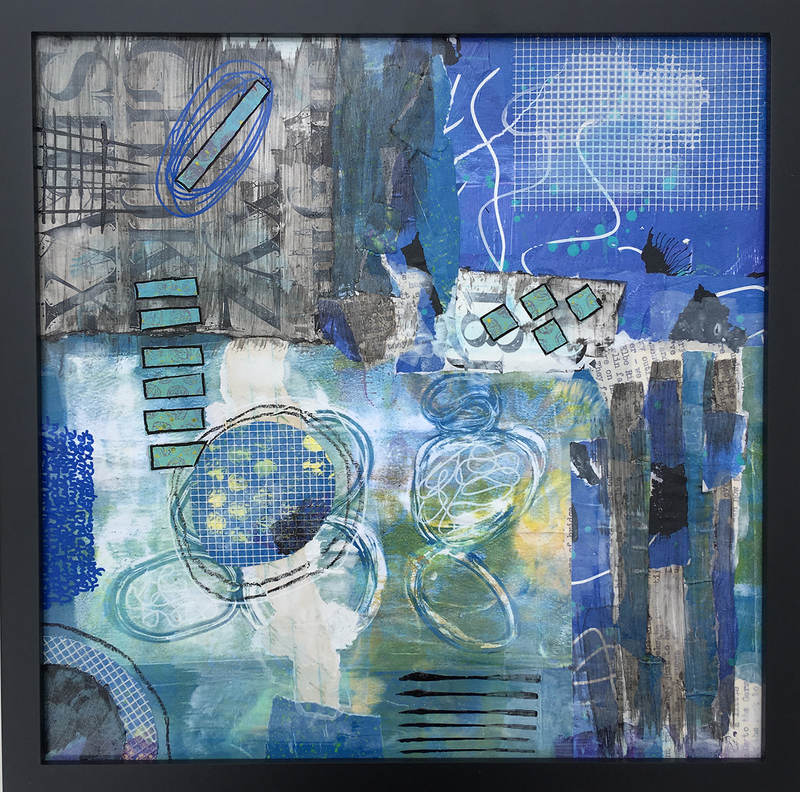 Abstract mixed media collage on 12″x12″ Masonite panel with black wood frame. 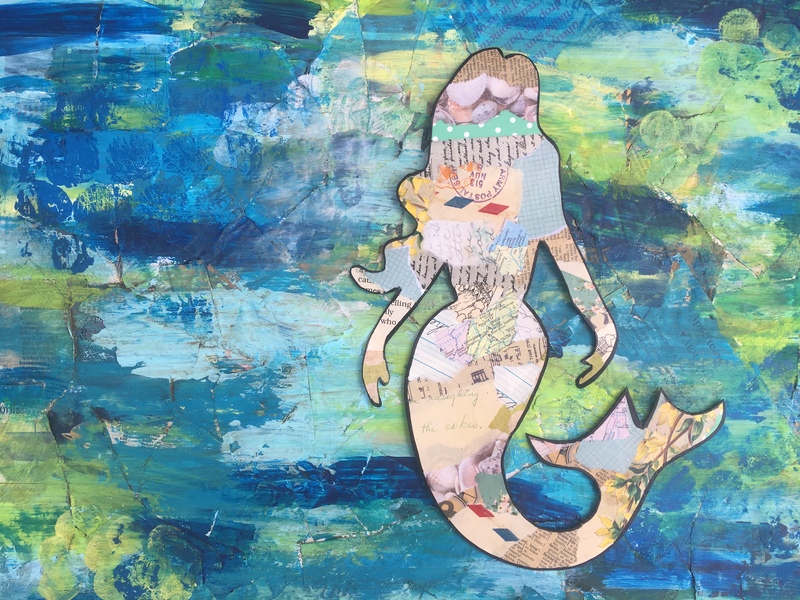 This sweet collaged mermaid stands out on her colorful, intricate, layered background. 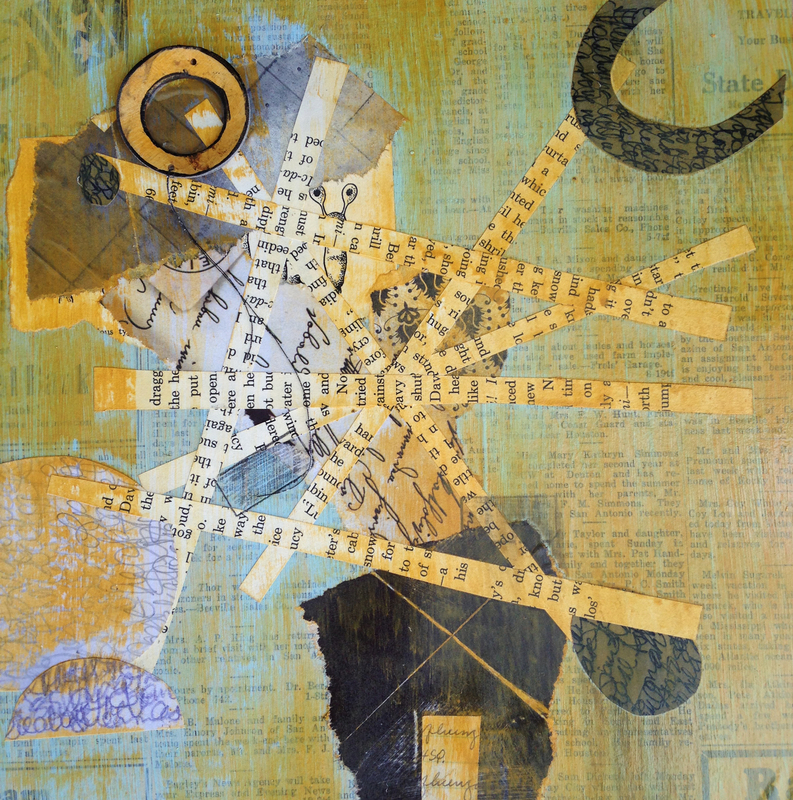 The collage measures 16″x20″ on a wrapped canvas, with painted edges and a protective gloss finish, she is ready to hang. 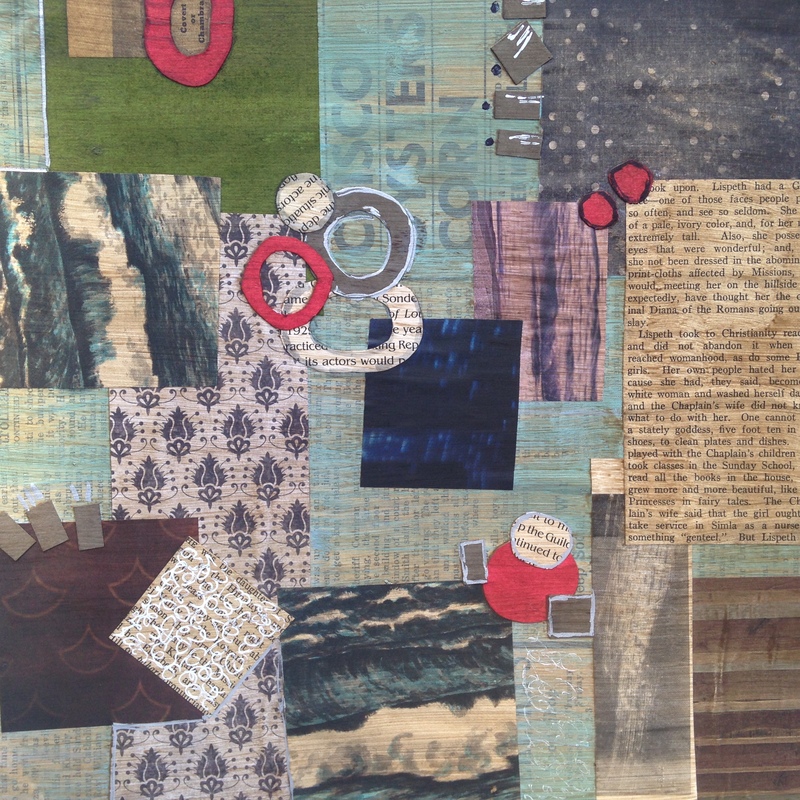 I created this coastal-inspired gal for Wine, Whine and Design at the Port Aransas Art Center. Fifteen ladies joined us and we collaged our fingers off! 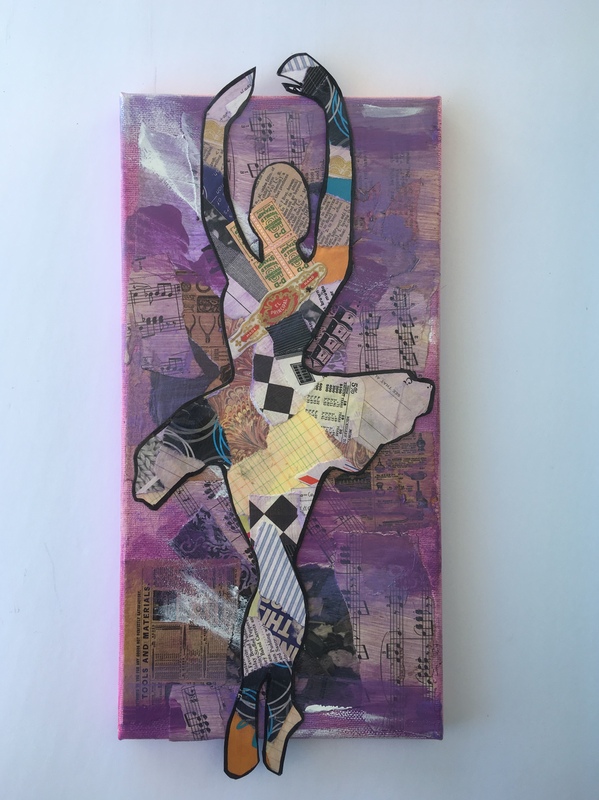 This sweet collaged ballerina stands out on her colorful, intricate, layered background. 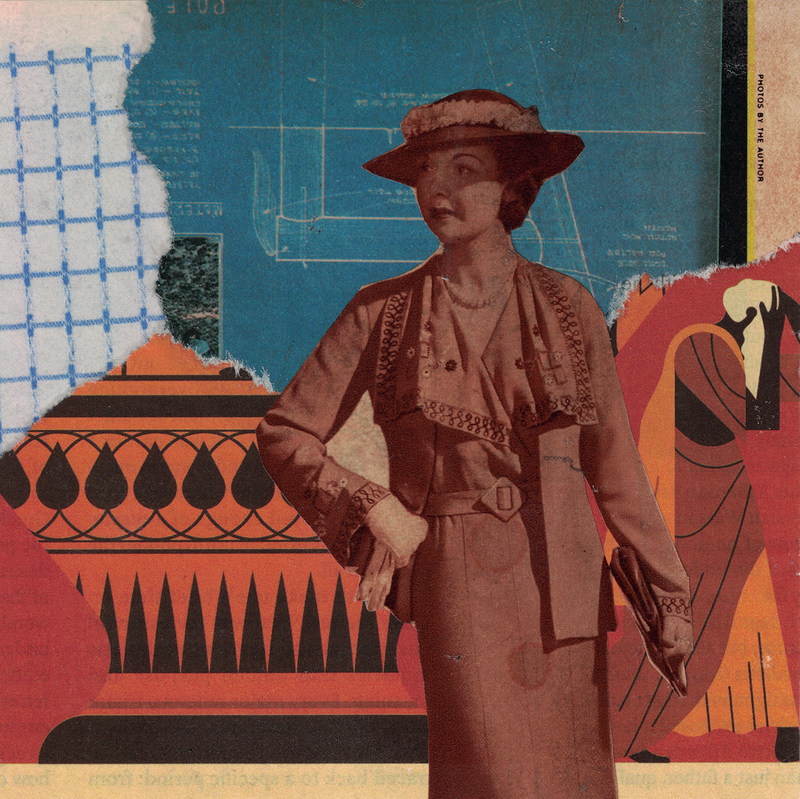 “Stepping Out” is an original, handcut paper collage on 5″x5″ heavy watercolor paper. 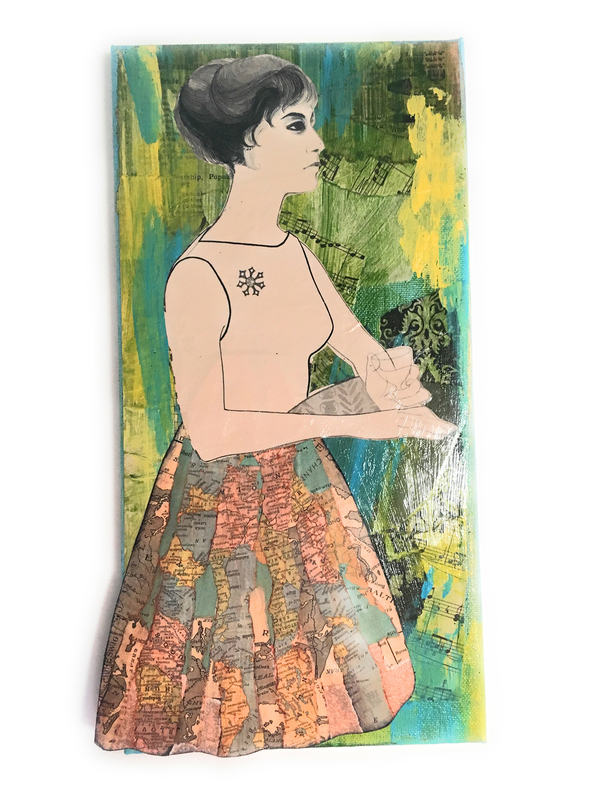 This sweet vintage gal stands out on her colorful, intricate, layered background. She loves travel, and is dressed up in her “skirt of maps” and her finest brooch. 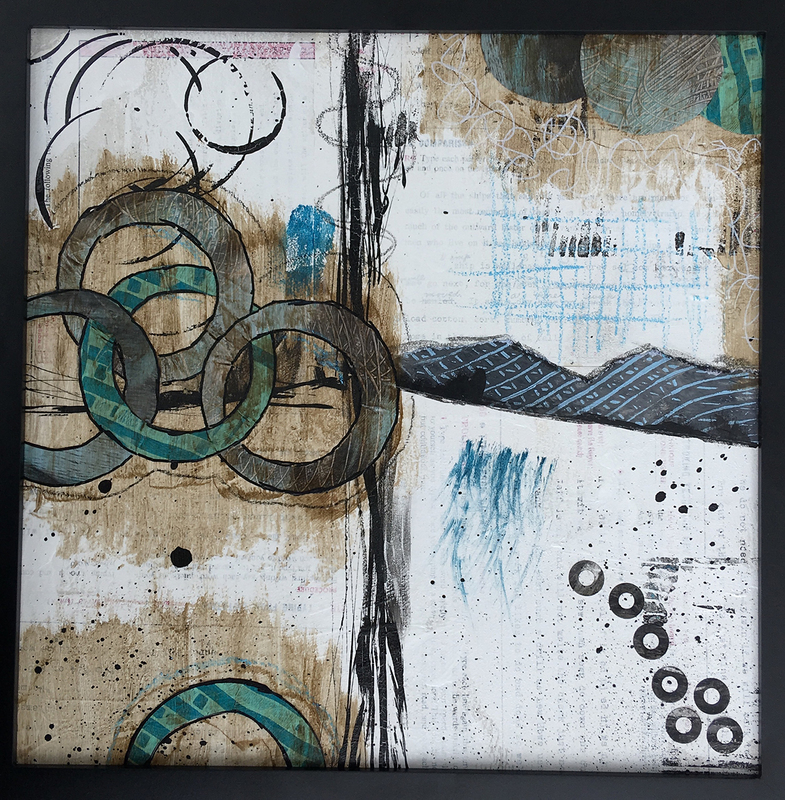 A playful abstract, “Cartwheels” is a new mixed media collage on a 10”x10” wood panel. 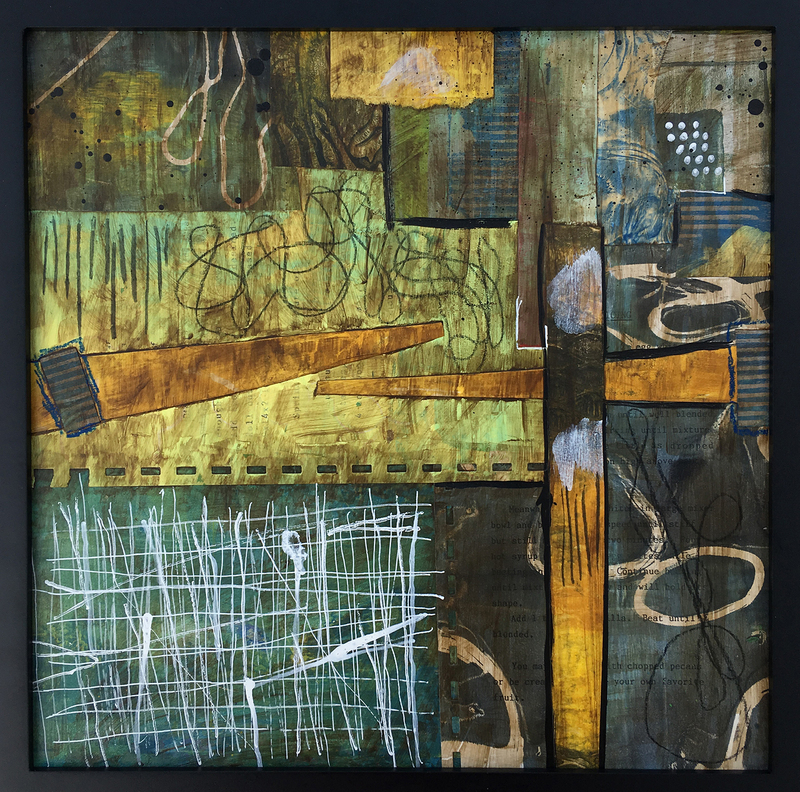 With a high gloss finish, and stained edges, this beautiful abstract artwork is ready to hang. 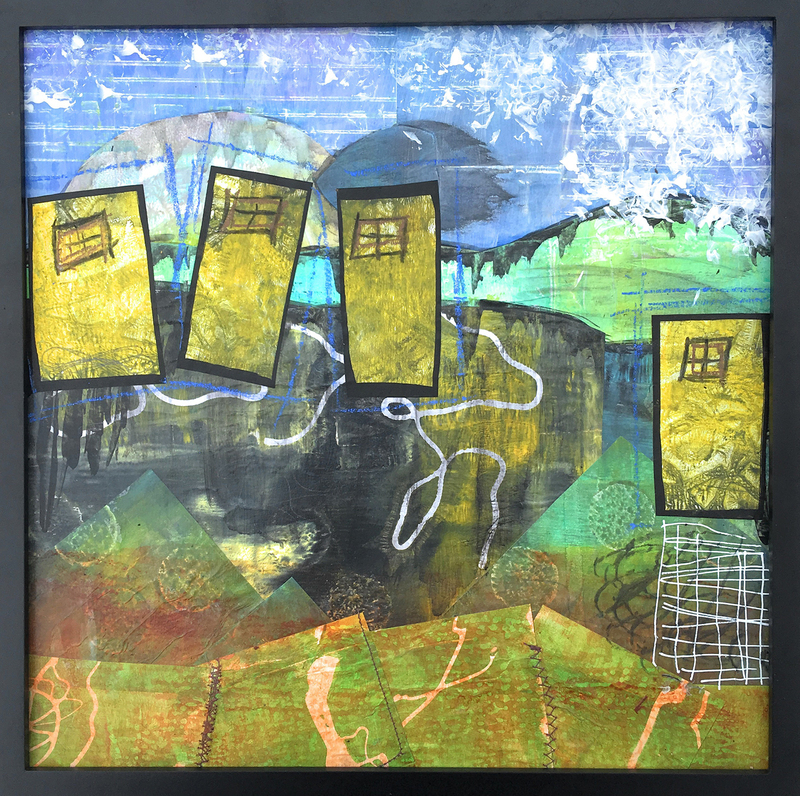 Reminiscent of a vintage quilt pattern, “Ancestral Vortex” is a new mixed media collage on a 10”x10” wood panel. With a high gloss finish, and stained edges, this beautiful abstract artwork is ready to hang. © 2011-2019 Play on Words Design.